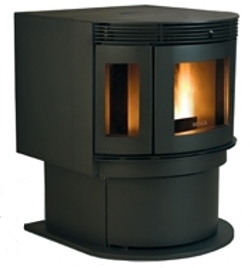 The Bosca Soul 700, available both as a freestanding stove and as an insert is a very modern cleanly styled stove with an almost semi-circular front. The door has a large central window, with smaller viewing windows on each side. Able to heat an area of from 2,000 to 2,500 square feet, the Bosca Soul produces 47,000 btu. The hopper capacity is 80 lbs., giving a maximum burn time of 80 hours, (75 hours for the insert version). 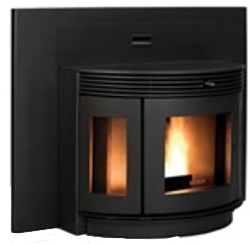 The Soul insert comes with variable hopper sizes, allowing it to be fitted to smaller fireplaces, (see below for dimensions), and two sizes of surround. The ashes only have to be emptied after burning a ton of fuel and a decorative brick effect fireback comes as standard. Heating Area 2,000 to 2,500 sq.ft. Weight Freestanding 366 lbs. Insert, 308 lbs. Window Size Central, 10 in. by 10 in., Side windows, 10 in. by 3 in. Top Vent Not on the freestanding stove, Yes on the insert. Rear Vent Height 19 in. freestanding. Insert has top vent for easy chimney installation. Two sizes of surround for the insert. Decorative fire bricks come as standard with this stove. 40 in. wide by 30.5 in high, or 45 in. wide by 34 in. high. The insert's hopper is adjustable to suit your fireplace dimensions, but reducing the capacity will also reduce the burn time. Here's an unsolicited recommendation from Dale Bunger.
" Purchased a SOUL Freestanding Pellet Stove in 2010 and it has been great. The stove looks very good and we have had no problems with it since it was installed. It really pushes the air out and does most of the heating of our 2000 sq/ft home." If you would like to leave a review of the Bosca Soul, please use the form on the contact page.